Super Rommel: This is Monogram's 1/24 scale Rommel's Rod - super detailed with three super detailed figures. It was manufactured in the late 60ís - early 70s by Monogram, designed by Tom Daniel. This is Field Marshal Rommel and his crew on guard for the elusive British Army. They will be out there forever! I have always wanted to build a Rommel's Rod, super detail it and add uniforms to the figures. This Rommel's Rod is a frame-up restoration of a previously built model. I completely dismantled and rebuilt it. 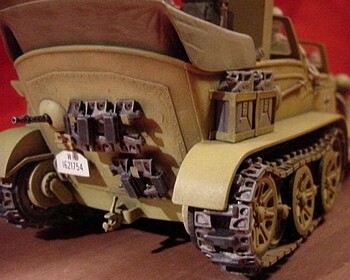 I had an old Tamiya 8-ton German half-track that the road wheels and track were the same size as the ones that came with the Rommel's Rod so I replaced them with the Tamiya parts. The tracks were tied down to show a realistic sag. New treadplate flooring was added to the rear compartment. Other details include: an arm rest for the commanders seat, new windows, rear view mirror, three handle jerry cans & holder, antenna & mount, interior door panels with interior and exterior door handles, stepping mats outside of each door, new marker lights on the front fenders (with clear amber lenses), new commander flags on each fender and front and rear license plates. Some molded on details were ground off and new more realistic items replaced them (shovel, spare tracks, etc.) A new table was made for the rear compartment with a scratchbuilt German Radio, microphone & headphones with the wiring added. Other details include a scratchbuilt wine bottle, canteen, gas mask, canister, ammo box, rear distance light, towing hitch, clutch, accelerator, brake pedal, shifting lever, emergency brake handle, a better detailed rear MG34 and a lot more! The dashboard was cut out and a new one added with realistic dials, glass for the dials, and switches. The air vent in behind the hood was cut and opened; handles to both sides of the hood were added. The storage box on the left rear fender had new details added, (latch and lifting handles). The front portion of the rear compartment had a wall added under the window with a compartment for the first aid kit. 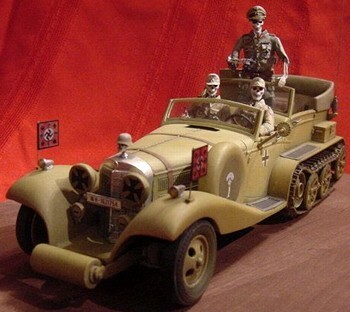 The two sitting figures were built stock with the rib cages scratchbuilt, helmets were removed and the famous M42 Afrika Korps caps scratchbuilt and added. Uniforms were made from lead foil, putty and a lot of patience. The arms were put into relaxed positions. Iron crosses, belts, pockets, collars and badges were cut from thin plastic or lead foil. All insignias are correct including the green Afrika Korps cuff title on the lower left hand sleeve. 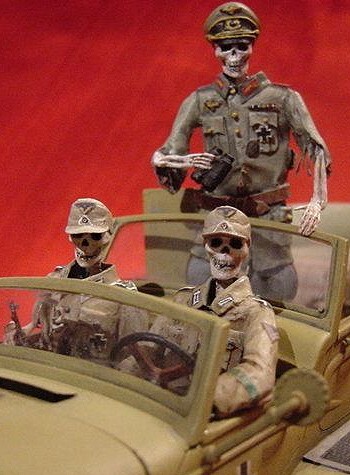 The driver is a Senior Corporal; the passenger is a Sergeant (he is also holding an MP42 (Machine Pistol). The standing figure is wearing the uniform of Field Marshall Rommel. It was also made from lead foil and putty. Insignias are correct here too. The head of the standing figure is the officer's head from the Rommel's Rod kit. All details were removed from the visor hat and new details added including light gauge wire for the piping. The holster, (for his Luger pistol), on his belt was scratch built from resin and lead. Instead of giving him the Khaki colored uniform I decided to make it Field Gray with the stone gray riding pants to add more color to the model. Boots on all three figures were built up with putty, lead and shaped into more realistic looking ones. I tried to make the uniforms look old and tattered with bones showing through here and there. 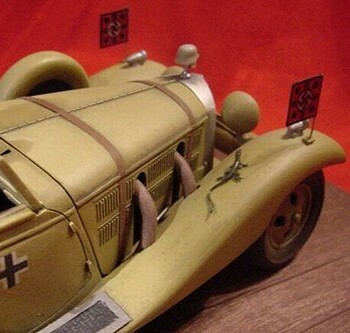 The vehicle was airbrushed a German Panzer Yellow and given markings for the Afrika Korps. Several washes were done and then it was drybrushed with lighter shades of the base coat to show some fading. Details were hand painted. 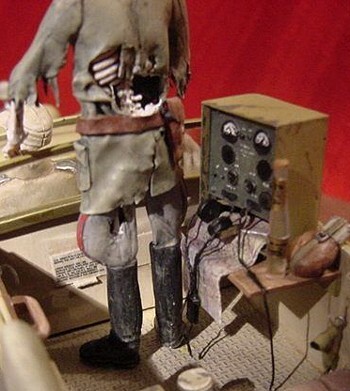 The lower portions of the model was airbrushed with a light coat of dust. The lizard on the right front fender was an after thought that added a nice touch. I spent many enjoyable hours on this piece and added as much detail as I could think of to make it realistic looking even though no such vehicle existed. I think it turned out exceptionally well with an eye appeal to it (the pictures don't do the model justice). I tried to show as much detail as I could, but with six pictures you can't show it all. It would make a unique and interesting, as well as a one of a kind display piece. The plaque is stained and goes with it, although the vehicle is not attached to it.